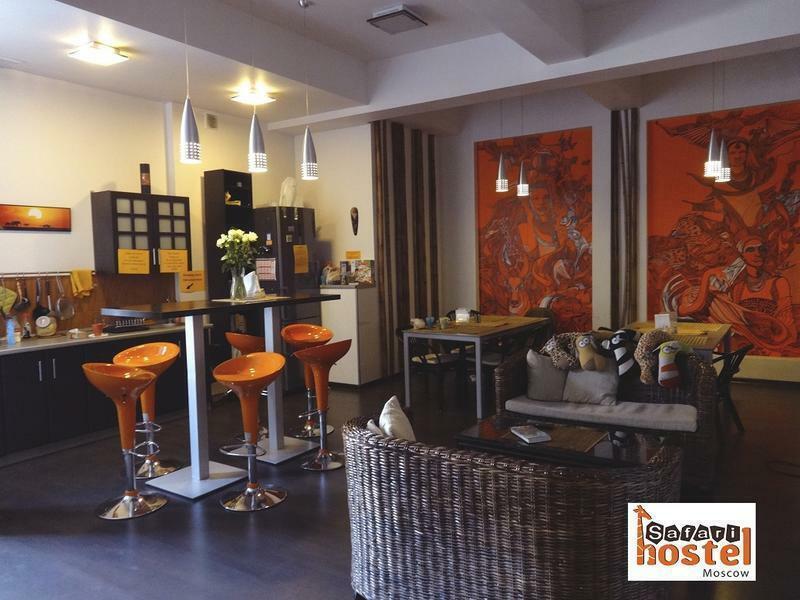 Safari Hostel is perfectly located the heart of Moscow - 5 minutes walking from the Kremlin, Red Square, Bolshoy Theater and many other famous sightseeing. A lot of cafes, restaurants, bars are in the neighborhood as well as the several stations of metro and other public transport. Our hostel is opened by travellers and for travellers and we always glad to offer you the comfortable bedrooms, nice decorated living room, fully equipped kitchen, plenty of showers and the most important - very friendly atmosphere. Our staff will always do their best to help you. Reception is opened 24 hours, and the wi-fi is always free. The nearest metro station is Trubnaya (3 minutes on foot). Take the airport express train (320 RUB, 35 minutes, trains depart every 30-60 mins) to Belorusskiy railroad station and take the metro on line 2 (green colored).Then travel straight to Teatralnaya or Tverskaya station. Or take line 5 (brown colored, circle shaped) and travel with one change to Trubnaya station. Or you may take a bus from the airport to metro station Rechnoy Vokzal (also line 2). Price is 50 RUB, and it takes 30-60 minutes to reach metro depending on traffic situation). Then take a metro and travel as pointed above (~40 minutes). Take the airport express train (320 RUB, 45-50 minutes, trains depart every 30-60 mins) to Paveletsky railroad station and take the metro on line 2 (green colored).Then travel straight to Teatralnaya or Tverskaya station. Or take line 5 (brown colored, circle shaped) and travel with one change to Trubnaya station. Or you may take a shuttle bus from the airport to metro station Domodedovskaya (also line 2). Price is 100 RUB, and it takes 30-60 minutes to reach metro depending on traffic situation). Then take a metro and travel as pointed above (~40 minutes). Take the airport express train (320 RUB, 40-45 minutes, trains depart every 30-60 mins) to Kievskiy railroad station and take the metro on line 5 (brown colored, circle shaped) and travel with one change to Trubnaya station. Or you may take a shuttle bus from the airport to metro station Yugo-Zapadnaya (line 1, red colored). Price is 100 RUB, and it takes 30-60 minutes to reach metro depending on traffic situation). Then take a metro and travel also with one change (~40 minutes). When get out of the subway at Strastnoy Boulevard, please keep the right side of boulevard until crossing with Petrovka street. Turn right and walk straight down the street. There will be a belltower on your left left, and then you'll pass the light-brown and 6-stores building. There is an arch in the end of this building, please turn left there. The walk more 50 meters straight, and on your right you will notice our bright orange door. Travel time is approx. 8 minutes. The exit from subway is directly at the square of Bolshoy theatre. If to stand in front of it and look to it, there is Petrovka street going and right side. Walk this street about 5 minutes and you will see tall belltower in front of you (at your right). Previous building before this belltower (light-brown and 6-stores) has an arch. Turn right and walk more 50 meters straight, and on your right you will notice our bright orange door. Travel time is approx. 8 minutes.